Vadavo Review 2019: Is Vadavo a Good Hosting? Vadavo is a Spanish hosting company that offers flexible and SLA-backed hosting plans and personalized support to customers. They fully own their hardware and don’t resell to third parties. 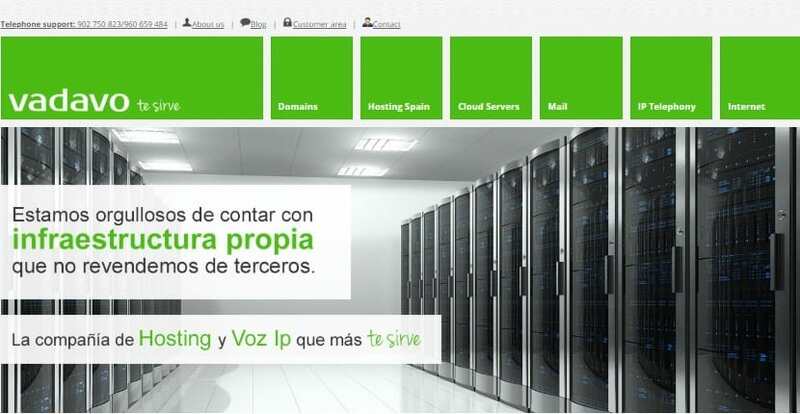 Based in Valencia, Spain, Vadavo is a small hosting company that also provides cloud servers, IP telephony, and domain registration services. Vadavo may not be in the league of giants in the hosting industry, but they’re clearly punching above their weight. Their servers come with solid-state drives which deliver superb performance. Customers enjoy three daily backups of files, mail, and databases (totally free with all their plans). With a few clicks, you can easily restore all the vital data in the event of a disaster. The entry-level package is the Start Plan. You should go for this if you’re getting started or want to test the waters. This plan gives you 1.2 GB of space and 15 GB transfer bandwidth. If you have an established blog or website, I would advise you to go for the Advanced Plan which comes with 5GB storage space and 100GB transfer bandwidth. Apart from shared hosting, Vadavo also provides Cloud servers to those who need more resources or space. Their Cloud engineers can help you configure your server based on your desired RAM, processor, disk space, and transfer bandwidth. With SSDs that are 10 times faster than conventional storage, their servers can handle all your workloads efficiently. Though mobile-friendly, Vadavo’s website isn’t attractive or sleek. I have seen far better websites. They should rework the design (layout and graphics) and create an English version for international customers. That notwithstanding, it’s comforting to know that they offer cPanel. If you’re familiar with it, you will find it easy to manage your web space. Other than the outdated design, everything else looks good. Vadavo has a transparent pricing policy. What you see is what you pay. I like the fact that they don’t charge a setup fee or pass the cost of advertising and gifts to customers like some hosting providers do. For a small fee, you can get a good number of add-ons, such as additional SSD space and professional email with an antispam filter to complement your hosting package. Customers receive personalized support. When you sign up, you will be assigned a personal advisor to help you whenever you need guidance or support. Their support is in Spanish only. I looked at their Facebook and their comments are in Spanish too. You can reach them by phone, Whatsapp, email, or via the online messaging form. Typical responses take about 30 minutes. Being a company that readily welcomes feedback and suggestions, they give you an opportunity to suggest what they can do better. Every hosting plan comes with a 99.9% SLA. If your page fails to load fast, you can ask for a partial refund. With Vadavo, you get a range of hosting plans powered by stable servers and extras at a reasonable price including fast and friendly support. Wondering how Vadavo stacks up against other Web Hosting companies? Enter any other Web Hosting company and we will give you a side-by-side comparison.